A NEW era of Mazda begins now. That's what we're told under sunny Los Angeles skies as covers are pulled off the all-new Mazda3. 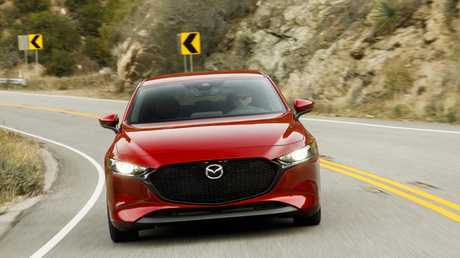 LA is hardly immune to exaggeration and fakery but Mazda's claim feels less fairytale-like when we actually drive these small hatchbacks and sedans, due in Australia by mid-year. An all-new version is a big deal, not least as rivals Toyota Corolla, Ford Focus and Kia Cerato have just been refreshed, all to strong acclaim. Then there are the ever-talented VW Golf, Hyundai i30 and Honda Civic … the list goes on. 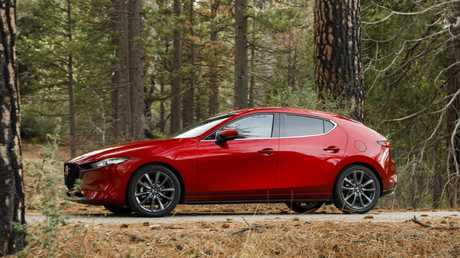 The current Mazda3 is the second best selling car in the country after the Toyota Corolla. Australian prices and specifications will be announced in three weeks. Meanwhile, our brief taster of the new Mazda3 suggests it won't struggle in such talented company. 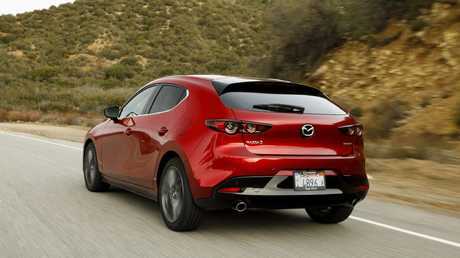 Mazda's been brave with design - the hatch's thick-pillared rear is sure to polarise. The sleek, large-looking sedan shares only its windscreen and bonnet with the smoothly crafted five-door version. Beyond simple aesthetics, Mazda's done deep research into the human side, examining movement and emotional responses to deliver "a driving experience that best matches human sensibilities". Very on-trend. On the more tangible front, the new 3's cabin is a polished effort, with classy and clean design, ample soft-touch plastics and satisfying-to-press buttons. Noise insulation is excellent at speed: a huge improvement over the current model. 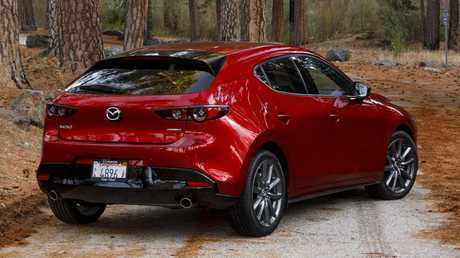 Mazda3s have long been enjoyable cars, their Achilles heel being noise suppression far behind that of rivals. Mazda has worked hard at reducing road noise in the new 3. The non-turbo engines - tweaked 2.0-litre and 2.5-litre petrols carried over from the current car - are hardly ripsnorters but the new car's ease of driving and its handling and balance are quite brilliant. The brand champions driving joy and its engineers aim for what's called Mazda Premium. As the new 3 glides through tight corners with minimal steering correction, body movement or noise intrusion, the impression is job done. Mazda Australia boss Vinesh Bhindi says: "Mazda Premium is talking specifically about quality, ride, (reducing) noise, vibration, harshness and audio improvements. All facets have been taken to the next level." Mazdas are known for excellent driving manners. When car companies talk of their single-minded focus on making the driver "at one" with the vehicle, it's typically just hype. Mazda is backing up the human focus with design changes stemming from numerous research and development studies. As an example, it aims for optimum pelvic posture. Apparently a means of making the drive "effortless and joyful", this involves the correct form of the seat, ideal placement of the gearstick and minimising audible and visible distractions. A Zen-like approach to car building. Our test drive was brief, in a European-spec hatchback with 2.0-litre engine (down on power to Australian models) and a softer-sprung American-spec sedan with 2.5-litre. There's no Toyota Corolla Hybrid rival on the horizon from Mazda yet. Australian buyers will have to wait for the new SkyActiv-X engines. Tyres, engine performance and specification may differ in Australian versions but the basics of a very competent car are obvious. The manual gearbox is slick and light with satisfying short shift. The popular auto works seamlessly and there are steering wheel paddle-shifters. To match rivals that are upping standard spec, Bhindi tips the coming 3 to have solid safety, infotainment and convenience gear range-wide. Expect a starting price from $23,000 as a result - the current base Neo Sport is $20,490. The new 8.8-inch screen has been set further back atop the dashboard for better visibility. A rotary control dial scrolls navigation, information and entertainment menus - there's no touchscreen, which is an annoyance when using Apple CarPlay/Android Auto, but voice control does the job. Our cars had no rear air vents, although we were told it's possible Australian cars will get them. It would be mad not to. The hatchback's boot, small at 295L, packed only a tyre repair kit rather than the space-saver in the sedan's. Space and light are good for sedan rear occupants but the hatch's large roof pillars make it claustrophobic back there as well as hampering the driver's rear vision - blind spot monitoring should be standard. 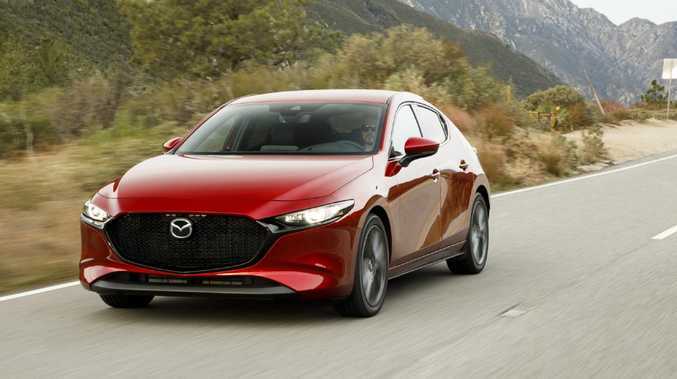 Fuel economy won't be up there with the best, but Mazda Australia wants the brand's SkyActiv-X high compression petrol engine, which boosts economy by up to 30 per cent, to be fitted to range-topping Mazda3s by year's end. On our brief Californian drive, the new 3 played to its "driving joy" strengths. Foremost are its sumptuous body design, abundance of quality and features and admirable chassis balance and agility. It is set to be more compelling than ever but its final specification and price will determine just how good a car it is. 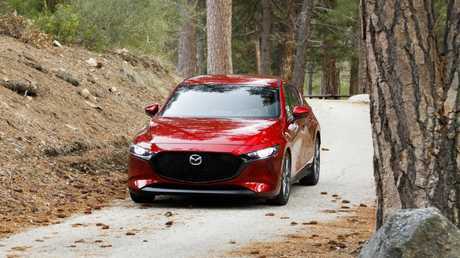 The new 3 shows Mazda’s evolved design language.